This page is about the British fighter Typhoon Mk Ia. For other versions, see Typhoon Mk Ib and Typhoon Mk Ib/L. The Typhoon Mk Ia is a rank II British fighter with a battle rating of 2.7 (AB/RB/SB). It has been in the game since the start of the Open Beta Test prior to Update 1.29. 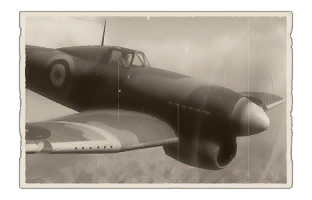 The Typhoon Mk Ia is a fast fighter for its rank, but isn't good at turning due to its massively thick wings. The Typhoon Mk Ia is a great fighter for the rank it is at. The first thing you will notice with the Typhoon Mk Ia is that it is insanely fast, so diving at a five to ten degree angle, if you are being attacked or if your attack failed, is a solid choice if you have the altitude that is. 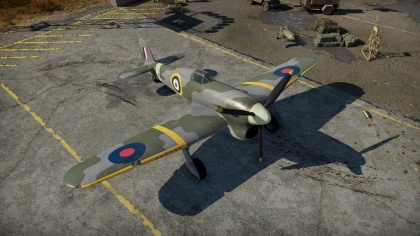 However, if you are playing Arcade battles with this plane the diving tactic may not work since the Arcade battle maps are quite small, it is still worth trying since it is a low tier plane and because of that have a low repair cost. One other thing worth noting is that the Typhoon Mk Ia has 12 x 0.303 calibre machine guns, which is a lot of guns, but they are only rifle calibre guns so if you want to take down bombers, you should consider getting another plane with cannons. But you are a fighter after all, not a bomber hunter. In Arcade battles, the Typhoon is quite powerful, not as in powerful guns, but as in great performance powerful. So, how should you use it? Well, the first thing you want to do is to climb, because then you can dive on your enemies and take them by surprise, which you really want to do since the guns are not that great. You should try to only engage other fighters, engaging fighters that's slower than you is the best thing you should do since your speed advantage works best on them, after you have successfully dived on a fighter and damaged him, do not start a turn fight, instead just dive away and when you are about 3 km from the closest enemy, climb back up to altitude. By doing this you both can and will survive longer to get more research points (RP) and silver lions (SL). And research points is something you want to get your plane fully upgraded and by that increasing your maximum speed. And you can use better ammo, and since you have a lead indicator in AB stealth ammo is recommended. By using stealth ammo your element of surprise will go up to since the enemy will not see your bullets until it is too late. In Realistic battles, the first thing you should note when flying the Typhoon Mk Ia in RB is that since it is so fast it both can, and will, have its elevators locked up when getting close the maximum speed. The first one being simply slowing down. That has a risk however, since the plane you are diving on might be able to catch you when you are trying to outrun them. The second thing you can do is diving on your enemy at a less steep angle, you will save your speed by doing that, but this tactic have a downside too. The enemy can dodge your attack much easier if you are doing this. The only this he (or her) has to do is to simply turn, which will reduce the time you can fire at the enemy, which is bad. If the enemy is turning, do not follow the turn, just fly away and get your speed back to altitude, when out of shooting range. The third thing you can do is investing in a crew skill called "Stamina". "Stamina" greatly reduces the elevator lock up when in a dive, but it will take a while to build up enough points to make the crew skill useful. The Typhoon should try to only attack fighters. And if you are seeing a IL-2 flying low and slow, don't even bother. IL-2s' have great durability and you will only waste ammo trying to kill it. Ammo which can be used on other fighters. Here are some things you should note when meeting different nations, we will start the USAF. At this tier USAF have many fighters with 0.50 calibre guns, for example: P-36, F2A, F6F, A-20, SBD-3 and the list goes on. Avid those, but with the great tactics that is listed in this wiki-page you will have no trouble avoiding them. Most USAF planes are fast, that means if you turn with them and lose your speed, you are dead. Next up we have the mighty Luftwaffe (Germany): the Luftwaffe have some great fighters at this tier, for example the Bf 109E-3 and Fw 190A-1. The Bf 109 can out turn you but you will outrun him. Most of the time. The FW 190 is another story, this plane both can and will outrun you, but fear not, you out climb the Fw 190 and can by that get an speed and altitude advantage. You can also in some cases out turn the FW 190, but it is foolish to turn in a Typhoon any ways. The Mc 202 is a plane to avoid, and it is quite easy, just point your nose down and see him disappear. Anything but turning with him. The next nation is the USSR. At this tier the USSR has many great fighters, most of them have cannons. And most of them can out turn you, bout you should know not to turn any ways. You do outrun them though, so use tactics listed above. One thing worth noting is that the planes of the USSR have great durability. And you will have to do more than just one pass against them. The next nation we will take a look at is Japan (We are skipping Britain since you will not meet them in RB any ways). All planes at this tier out turn you. But it must be your lucky day! Because every single Japanese plane at this tier is slower than you! So, use diving tactics listed above. Japanese planes are quite fragile and you will most of the time just have to do one pass. One last thing! Practice in AB to learn how you should aim the guns and then get stealth ammo and use it in RB. When it comes to Simulator Battles, most of the Realistic Battle tactics apply here too. However, due to the very limited view from the cockpit and low roll-rate make checking the six very difficult. Gun range should be set to 200 - 250 meters causing a close convergence. The greatest strength of the small calibre .30 cals show up in this mode: Destruction of control and lift surfaces. The rapid change in aerodynamics cause plenty of pilots to lose control and crash. Of the rank I upgrades, only Offensive 7 mm is of noticeable effect to allow for belt choice for the 7.7 mm armaments. The next level's Compressor should be the first choice, with Airframe and the HSBC mk.2 as unattractive choices. Having the option of a last ditch ground attack with the bombs may save the occasional game though. For rank III: Engine, New 7 mm MGs and Wings repair in that order, just having the ability to preform long, accurate burst fire (against bombers) makes the armament upgrade worthwhile. Last level is Engine Injection. The remaining modules can be chosen for research by personal preference. A great fighter in AB, a great fighter-bomber in RB and SB. The Typhoon is a versatile aircraft. This page was last edited on 11 April 2019, at 09:05.